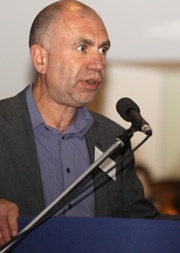 Peter Baker left the MHF in August 2012 after twelve years as the Forum's chief executive officer. Here he looks back on his time with the Forum and as founding editor of malehealth.co.uk. Thanks for everything, Peter. I was working as a writer and journalist with a growing interest in men’s health when I first discovered the Men’s Health Forum. It was, I think in 1995, during my four-year stint as Maxim’s health editor. I was attending one of the first major national men’s health conferences, at the QE2 Conference Centre in London. One of the keynote speakers was the then MHF Chair, later President and now good friend, Dr Ian Banks. He was, simply, hilarious and I can still remember his story of how, as a GP, he had to grab men by the collar to stop them running away while he pulled on a latex glove to do a prostate examination. I was already convinced that action was needed to tackle the poor state of men’s health – so Ian and MHF were what I had been looking for. In fact, I applied to be MHF’s part-time co-ordinator a year or two later but the panel opted for an RCN insider, perhaps unsurprisingly as at that time MHF was still closely linked to the nurses’ trade union, the organisation that had set it up in 1994. In 1999, I stood for election to the executive and got involved that way. (In fact, there was no election because, fortuitously for me, the number of candidates exactly matched the vacant posts.) As well as Ian, the executive I joined was already peppered with significant and influential people in the men’s health field, not least Alan White who went on to become the world’s first professor of men’s health and MHF chair. Jim Pollard joined the executive at the same time as me. I was keen to meet him as he’d recently displaced me as Maxim’s health editor (not his fault – it was the editor’s decision) and published a book on men’s health. At that time, the organisation was small in size and budget. The executive committee aside, there was a part-time co-ordinator, some limited funding from two pharmaceutical companies and a couple of short published reports mapping out some of the key issues. There was, however, a great deal of talk about all the things we’d like to do and a lot of arguments about how best to get there. Inevitably, one of the big areas for internal debate was whether MHF should accept funding from the pharmaceutical industry or try to make its way independently. Like many other health charities, we opted to take the money but to ensure that it came without strings, that we received funding from more than one pharmaceutical company and that this income was just one of many funding streams. While I was on the executive, my involvement with men’s health deepened. I had by that time moved on from Maxim and started work on a self-help book, Real Health for Men (published in 2002). I was also commissioned by Radcliffe Publishing to be the launch editor of a new health information website for men, malehealth.co.uk. At the time, this site was completely independent of MHF – it was taken over by the Forum a couple of years later and, under Jim Pollard’s leadership, went on to become the biggest independent and comprehensive – and heavily-used – men’s health websites in the world. Everything changed, not least for me, when the Forum’s co-ordinator left in 2000 and I was asked to step in on a temporary basis. There was, at that point, about £25k in the bank and no office. MHF’s base became my spare bedroom in Brighton and Ian and I began to work out how we would make the organisation viable. We needed a strategy, and we needed one quickly, or the MHF wouldn’t have survived the year. Given the very poor state of men’s health, the almost complete absence of the issue from government and NHS policy, and the lack of any other national voice for men, this would have been a disaster. But we had some important things going for us. MHF had already attracted interest and support from a number of serious and well-known organisations. Ian Banks was a charismatic and influential figurehead with excellent connections into the BMA, Department of Health, pharmaceutical companies and elsewhere. The Labour Government, unlike its Conservative predecessor, had a serious interest in health inequalities and the social determinants of health, including gender. (The public health minister, Yvette Cooper, had publicly expressed her concern about men’s health and met MHF.) In the late 1990s, the launch of Viagra in the UK had stimulated public debate about wider issues in men’s health, such as why men ‘don’t go to the doctor’. MHF also benefitted from being the only national organisation with something credible to say about the broad range of health issues affecting men. But I can also be honest now and say that, at the time, what Ian and I were ‘selling’ was essentially a good idea – there was not, at that time, much research evidence or organisational capacity to back us up. If it looked like someone credible had money they might invest in us, we seldom hesitated to say ‘yes’. We drew the line at endorsing male hair restoration products (we really were once asked to do this – and Ian and I were tempted, but only for personal reasons), but we would consider pretty much anything else. The results were promising – increasing income and organisational capacity, important new outputs, and a growing profile and status for MHF. But we also knew that our long-term success depended on a more coherent, strategic approach. Critically, we embarked on the tortuous process of becoming a limited company and a charity and then seeking serious funding from the government, companies, trust funds and other significant ‘players’. (Many of these organisations would not have funded us unless we became a charity.) We knew we had to produce research that started to prove some of our assertions and to underpin the policy changes we were calling for. We had to appear much bigger and better than we were. And one of our achievements has been earning the reputation of being an organisation that ‘punched above its weight’, a distinction achieved by Ian and I working 50-60 hours a week (or more) and gaining the support and active involvement of a growing number of influential organisations. Once we had sorted out our legal status, the first big turning point was securing core funding from the Department of Health. Our first grant, of about £60k a year, combined with other moneys we had secured from pharmaceutical companies and elsewhere, was enough to turn my post from a part-time, short-term one into a full-time, long-term appointment and to begin to employ other staff too. Ian became President and Alan White, now Professor of Men’s Health at Leeds Metropolitan University, morphed from executive member into an effective chair of the new Board of trustees. The next 10 years of MHF’s history were a time of growth in capacity and influence. Men’s Health Week was launched in 2002 and followed by major research projects on chlamydia screening, bowel cancer screening and mental health. A fortuitous meeting on a plane between Ian and the Chief Medical Officer at Royal Mail led to an important study of how to improve men’s awareness of prostate health at the workplace and subsequently a long-term partnership between MHF and Royal Mail. We helped to set up the All Party Parliamentary Group on Men’s Health, chaired until 2010 by the hyperactive and influential Labour backbencher Dr Howard Stoate MP. We began to work with other major companies, such as BT and Rolls Royce, developed the highly successful series of Haynes’ health Manuals, and their ‘Mini Manual’ spin-offs, and became a Strategic Partner of the Department of Health in 2009. We successfully influenced national health policy on cancer, mental health and the chlamydia and abdominal aortic aneurysm screening programmes. We have shown that men’s health is no longer just about prostates and penises. Men’s health is about any issue where male gender is a relevant factor – and that therefore includes heart disease, cancer, diabetes, obesity, mental health as well as men’s use of health services. We have also shown that there is no longer any reason to be fatalistic about men’s health. While men might hesitate to talk about their health or seek help, we now know they will do so if services are provided in ways that are better attuned to their lifestyles, beliefs and behaviours. We know, for example, that men are much more likely take advantage of MOT health checks delivered at the workplace or sports stadia, for example, than they are to attend a Well Man clinic at their GP surgery at 3pm on a Wednesday afternoon. We also know that men are more likely to seek information, and be influenced by it, if it is designed with their gender in mind – hence the success of MHF’s partnership with Haynes (best known for their car maintenance manuals) and our online health service. My involvement with MHF has certainly been hard work, but it has also been enormously satisfying and often very good fun. I have met and worked with many delightful and committed people, not least the exceptionally talented MHF staff (I wish I could name them all here). But what I’m most pleased about is the big impact our small organisation has had over a relatively short period: we’ve taken an issue that was of marginal interest at best and succeeded in pushing it into the mainstream. Not all health professionals, or many members of the public, may yet have heard of the Men’s Health Forum but a very large number are now aware that too many men die unnecessarily young or have preventable health problems and believe that action is needed to tackle this major inequality. Not every social change activist can claim to have helped make this kind of difference. After 12 years as Chief Executive, I have decided to step down. My reasons are both personal and political. I have three young children and want to regain a work/life balance that is hard to achieve in a small but very ambitious national charity. I will still work in men’s health but as an independent consultant focusing on the issues that most interest me and which I believe to be the most important – policy and service development, advocacy, changing behaviour, training and research. I will continue to support MHF but will also work for a wide range of other organisations in all sectors. I am really looking forward to the challenge.